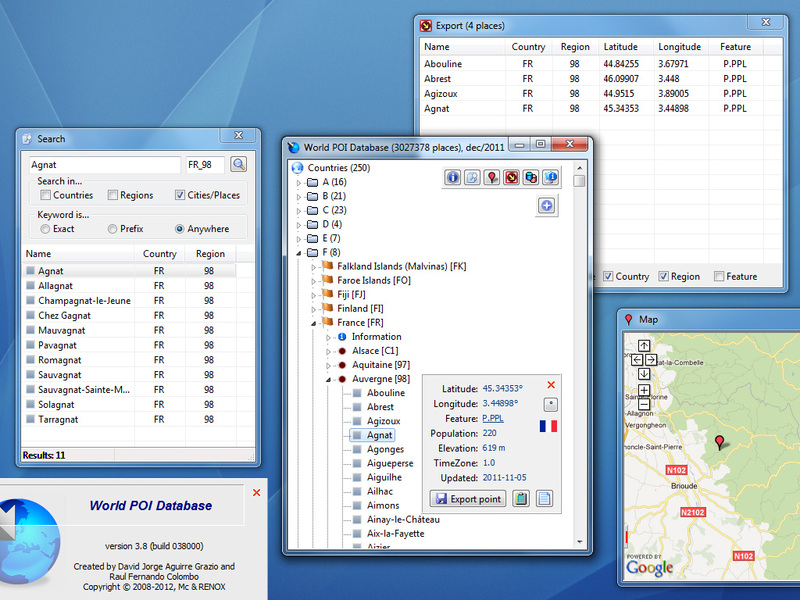 WorldPOIdb is a very large off-line database with 250 countries, 4,298,518 cities and 6,677,555 points of interest (47,390 cities in the free version), including country name, country code (ISO 3166), city/place name, region, latitude and longitude for many kind of places like locality, road, water, buildings, general terrain and vegetation features. In addition, WorldPOIdb has a powerful search engine allowing you to find cities or places by keyword, and gives you the ability to export waypoints of your places in KML (Keyhole Markup Language), GPX (GPS Exchange Format), CSV (Tab delimited) format or Microsoft Office Excel (XLS) format. Regarding our database, you can buy the raw database (instead of the software) in CSV (tab delimited) or SQL format for use in your own applications or websites. · License price: FREE for limited database. · License price: € 35 Euros for FULL database. · Requirements: Internet connection is required to download the database (first time). · Environment: Windows 10, 8, 7, Vista, XP, 32/64-bit. Microsoft Office Excel is a registered trademark of Microsoft Corporation.